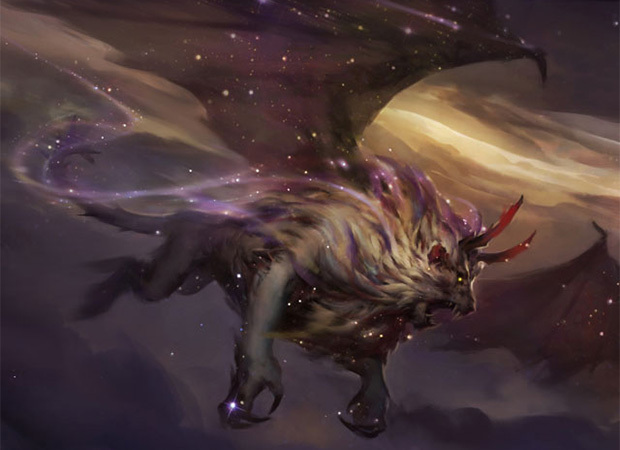 I've seen quite a few folks in the Multiverse excited to meet another manticore on Theros. I am too! My first experience with a manticore was alongside Bink as he tried to get to Humphrey for answers. They have fascinated me since! Most stories say manticores are so ravenous that when they eat a man they leave no possessions, clothing, or even boots behind. Good thing I'm a woman. Manticores typically have the head of a human, but with many rows of sharp teeth; the body of a red lion; and a scorpion's tail. If they have wings they are bat-like, not feathered. Magic has stuck to these rules pretty well. "A Masticore is a magically created artifact creature. It's design is as follows: the body and mane of a lion, a scorpion's tail, and a roughly humanoid face with a huge mouth with multiple rows of teeth like a shark. [It] should not look like a 'robot' but rather a magically animated creature, fashioned from Metal. The creature can repair [itself] by 'eating' metal and metabolising it into repairs." Although the myths about manticores originated in Persia, it was Ctesias, a Greek, who first spread the idea in the West in his writings. Theros, our top-down Greek-mythology-based world, wouldn't be complete without its very own manticore. The newest addition to the menagerie was ushered into creation by Ken Nagle; you can read more about the technical design bits in his article. But we're here for the flavor and art! This thing is just as vicious as the stories say! Did Min Yum get the look and feel creative was going for? I think so! Action: Show us a massive manticore that is flying through the sky. He should have an epic, Hellenistic vibe to him, flowing mane, amazing musculature. He could be streaking across the sky leaving a trail of Nyx starfield. Mood: Awesome Greek manticore cranked to 11.